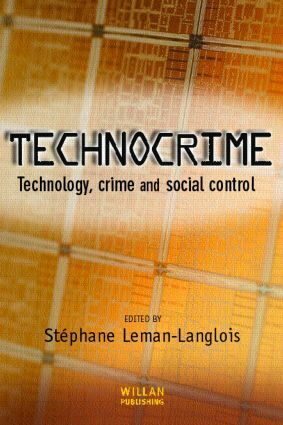 This book is concerned with the concept of 'technocrime'. The term encompasses crimes committed on or with computers - the standard definition of cybercrime - but it goes well beyond this to convey the idea that technology enables an entirely new way of committing, combating and thinking about criminality, criminals, police, courts, victims and citizens. Technology offers, for example, not only new ways of combating crime, but also new ways to look for, unveil, and label crimes, and new ways to know, watch, prosecute and punish criminals. Technocrime differs from books concerned more narrowly with cybercrime in taking an approach and understanding of the scope of technology's impact on crime and crime control. It uncovers mechanisms by which behaviours become crimes or cease to be called crimes. It identifies a number of corporate, government and individual actors who are instrumental in this construction. And it looks at the beneficiaries of increased surveillance, control and protection as well as the targets of it. Chapters in the book cover specific technologies (e.g. the use of CCTV in various settings; computers, hackers and security experts; photo radar) but have a wider objective to provide a comparative perspective and some broader theoretical foundations for thinking about crime and technology than have existed hitherto. This is a pioneering book which advances our understanding of the relationship between crime and technology, drawing upon the disciplines of criminology, political science, sociology, psychology, anthropology, surveillance studies and cultural studies.